You are currently browsing the archive for the Wassookeag category. 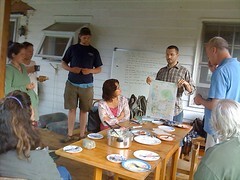 To coincide with Digital Humanities Week 2011, Joline Blais joins permaculture experts Julia and Charles Yelton, social media hackademic Craig Dietrich, Rural Maine Partners’ Claudia Lowd, and members of the Wabanaki community in hosting “Social Media and Sustainability” at LongGreenHouse, a clearinghouse for sustainable culture on the edge of the U-Me campus. 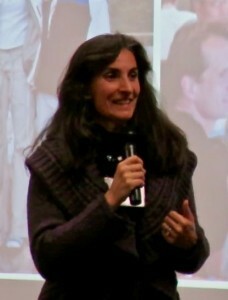 The talk was featured in Maine Public Radio’s “Speaking in Maine” series; mp3 and podcast available. For reference, here’s a longer transcription of Riggs concluding remarks. 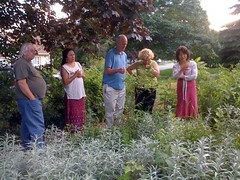 Bill Giordano hosted the Penobscot Valley Permaculture Meetup by giving a tour of the LongGreenHouse grounds. Visitors feasted on Young Me’s cheesecake, potato salad made with our own duck eggs, sample a variety of greens in the polyculture bed, and strategized solutions for the persistent university stormwater run-off that flows into the north corner of the site. We may be seeing the emergence of a permanent pond, with drainage to the street culverts. Sheet-mulch gardening is a no-till method for making raised beds. Abundant organic materials such as grass cippings, animal bedding, leaves, manure, newspaper, cardboard, mulching hay, straw and more can be layered on top of earth rather than yearly tilling. All materials break down and become nutrients for the soil food web. Sheet-mulched beds maximize soil health and minimize watering, mineral leaching weeding, and human input for years to come! Come get your hands in the soil and your heart closer to the earth! During the month of May, we’ll be planting a dozens of fruit trees, hundreds of berry plants, flowers and annuals at LongGreenHouse and sneaking onto university grounds, along the Food Corridor. 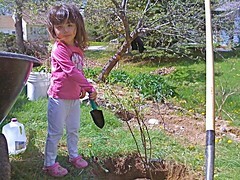 Main gardeners will include Bill Giordano, Joline Blais, Isis Bell, and gkisedtanamoogk, with help from 3-yr old Ellie. If you help us plant, you will earn funds in our local currency, which you can then spend on our eventual harvest. More important, you will be helping us seed a food forest that will spread through the campus, ensuring local food security, and you will be learning some permaculture techniques, like sheet mulching, guild building, and berry pyramid building. Other fruit Trees: Last two weeks of May. Snow has finally melted and LongGreenHouse has begun Spring Cleaning. We’re clearing constrcution debris from deck construction, preparing for sealing the cedarwood, raking aand pruning, and getting our garden beds ready. We’ll be planting spinach in the cold frame and lots of seedling in the greenhouse. 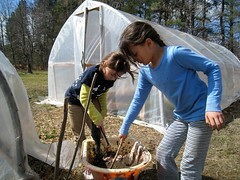 Tony, Debbie and Joline will be leading the seedling workshop for Wassookeag students and neighbors on Thurs April 9. Stop by to see what we’re doing, help plant, or trade seeds. Stay tuned for our May 1-2 fruit tree and shrub workshop! 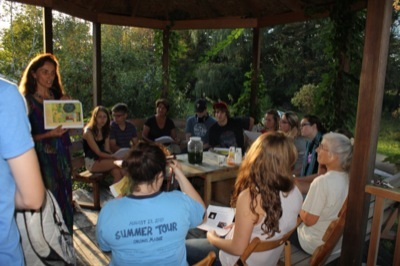 Science teacher Tony Sohns will be teaching classes for homeschoolers at LongGreenHouse on Thursdays starting this week. Renowned for his work with Bangor’s Discovery Museum, Tony’s energy, knowledge, and interaction kids is outstanding, and we are lucky to have him involved with our community. Tony will be teaching two sessions. The second 8 week session will run March-April. 4 – 6 year olds 10:00 – 10:45 $48. 7 – 9 year olds 11:00 – 12:00 $56. 10 – 13 year olds 1:00 – 2:30 $56.